The Season XVI WPT Tournament of Champions is around the corner. On Thursday, May 24, 2018, World Poker Tour title holders will embark on fabulous Las Vegas to compete in the prestigious event at ARIA Resort & Casino. The final table will play out at Esports Arena Las Vegas at Luxor Hotel & Casino on Saturday, May 26. In lead up to the event, WPT.com is featuring all of the winners from Season XVI, who, along with the hefty first-place prize, earned a $15,000 seat into the season-ending WPT Tournament of Champions. Next up is two-time WPT champion Eric Afriat, who topped a field of 1,244 entries in the WPT Borgata Winter Poker Open Championship to win $651,928. Eric Afriat continued one of the longest trends in World Poker Tour history with his win in the Season XVI WPT Borgata Winter Poker Open. Since Season VI, a former WPT champion from a previous season has won in the season that was currently running. Three-time WPT Champions Club member Darren Elias kept the streak intact in Season XV when he won the WPT Fallsview Poker Classic, and Afriat kept it going in Season XVI. Afriat comes into the Season XVI WPT Tournament of Champions with his best season yet on the World Poker Tour. Thanks to his fifth-place finish at WPT Montreal in November, his win at Borgata in February, and another cash a Seminole Hard Rock Hotel & Casino in April, Afriat is a contender for the Season XVI Hublot WPT Player of the Year title. Victory for Afriat at Borgata was earned through a grueling five-day event. Afriat was all in a few times on Day 4 and started the final table as the shortest stack of the six players. When Afriat won the WPT Seminole Hard Rock Poker Showdown in Season XII in the largest field in Main Tour history, Afriat kicked off what is now a formidable career. Afriat carries a fiery competitiveness when he plays and is proud of how he has built his game since victory first struck on the World Poker Tour. “What I am most proud of is that I readjusted my game to today’s poker (a little tighter) and play a little more of a defensive game and to know when to minimize and maximize the hands,” Afriat said. The WPT Borgata Winter Poker Open title was decided in a fierce heads-up duel between Afriat and Justin Zaki. Over the span of 99 hands and three hours, Afriat fought back from a 2-1 deficit to write his name on the WPT Champions Cup for the second time. Afriat credits his outlook on life to keep him positive during the swings of the tournament and heads-up play. “My experience of life and the way I was brought up is to never settle for second place and my vision on seeing things at the poker tables,” Afriat told WPT.com. Dressed well at the table, Afriat carries a unique presence. The sweaters and ascots are a disguise for a personality that is more whiskey than wine. Afriat wants to succeed at the highest level and lets his emotions out when he cannot achieve as he would like. The fits of micro-rage are replaced with fist pumps in the same orbit. Afriat’s emotions are sewn into his sleeve. The thrill of winning a second WPT title excited Afriat in the aftermath of his conquest at Borgata. Afriat defeated a field of 1,795 when he won at Seminole in Season XII and vanquished a field of 1,244 competitors this January. The cumulative field sizes put Afriat in rarified air. No other two-time or three-time WPT Champions Club member has defeated at least two fields of at least 1,000 entrants except Afriat. What Afriat does for a living is real estate. The Montreal native spends most of his non-poker time working on investments. When Afriat visited Florida in April for the WPT Seminole Hard Rock Poker Showdown, he did so as a mix of business and pleasure. His wife and children joined him there as well. The family support is what pushes Afriat to travel on a moderate schedule. After Afriat’s win at Borgata, he compared his wife to Adrian from the Rocky film series. Afriat usually sticks to the East Coast but made the trip to Las Vegas for the WPT Bellagio Elite Poker Championship. He also plans to participate in the WPT Bobby Baldwin Classic in a last-chance effort to win Hublot WPT Player of the Year. To win a third WPT title is not on Afriat’s immediate list of accomplishments he wishes to conquer. An honor as prestigious as the Hublot WPT Player of the Year trophy is a trinket Afriat says he “definitely” wants. The final event offers Afriat the opportunity to achieve a few separate accomplishments. 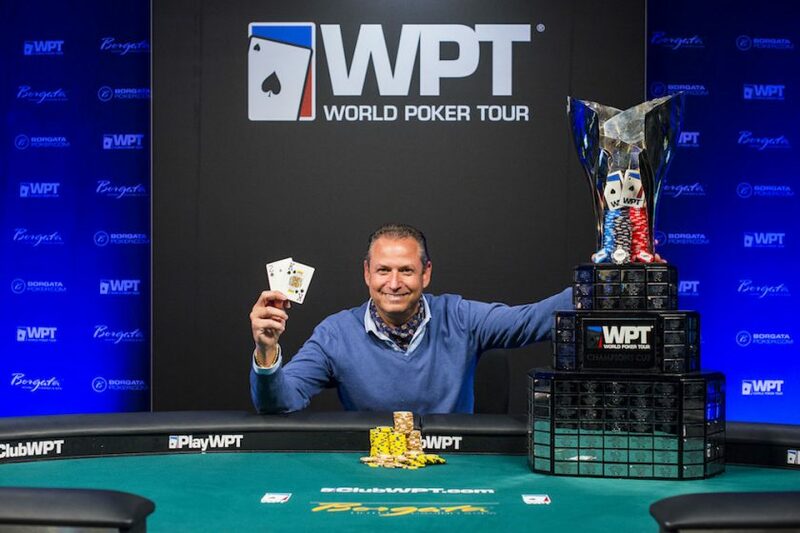 A win in the WPT Bobby Baldwin Classic equals a third WPT title for Afriat and a high chance of passing Art Papazyan for Hublot WPT Player of the Year. The passion Afriat carries with him moves to Las Vegas for an important week of poker. There won’t be a question of how Afriat does on a given day. It’s visible from a mile away.